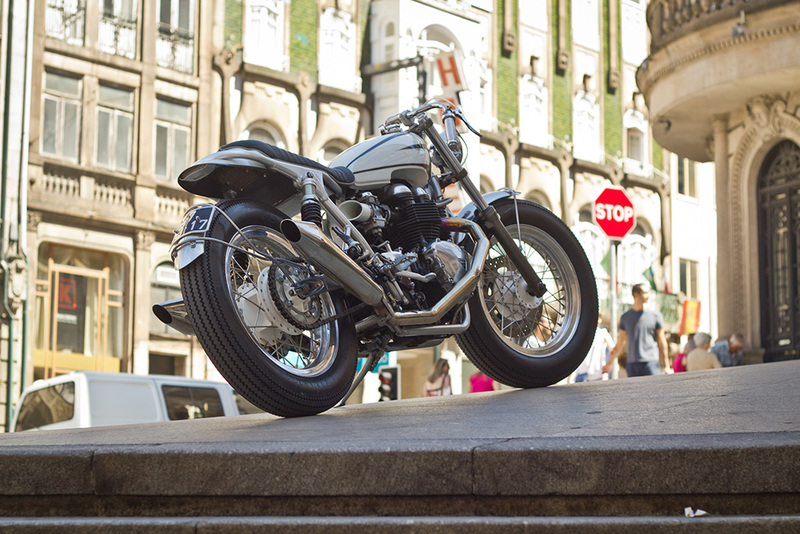 Daniel and Pedro are the names behind Ton-Up Garage, one of Portugal’s leading custom bike builders, two guys who consider themselves total petrolheads, loving anything with an engine. 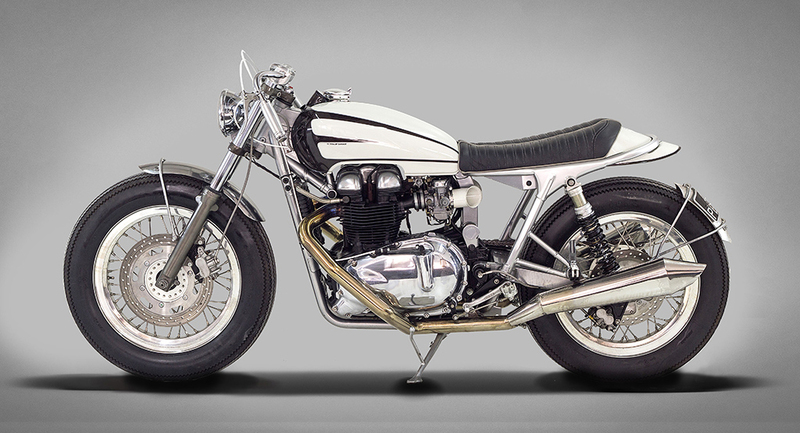 Being able to draw influences from all aspects of motoring allowed Daniel and Pedro to come up with the ‘Hot-Rod’, a truly fantastic custom Triumph Bonneville. A Classic Twin finding it’s influences in the “crazy years between the 30s and 50s, the golden era off Hot Rodding”. 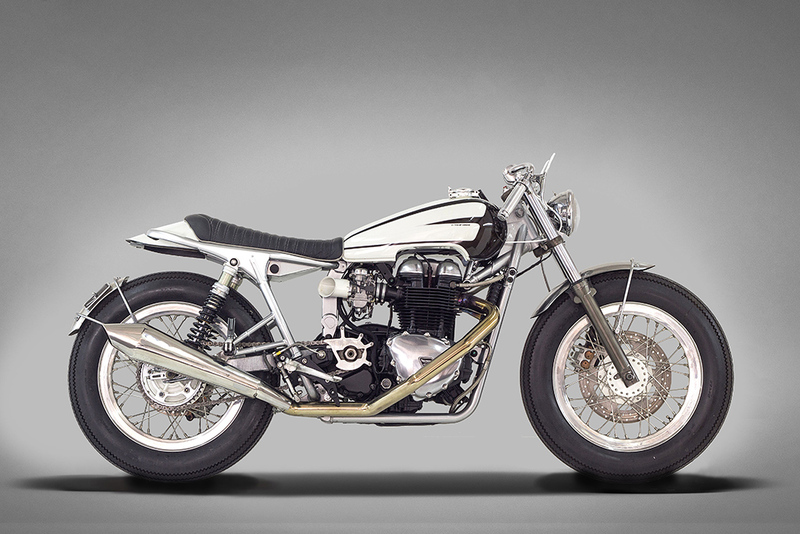 A refreshing custom born into a scene which could be described as a little stagnant – though no sports bike, this air cooled Triumph embodies a need for speed, fast acceleration and hold on tight thrill seeking. The Hot Rod’s side-on profile is something to behold, low and beautifully sculpted. It’s clear the frame has been shortened and looped, tightening up the Bonneville’s lines. 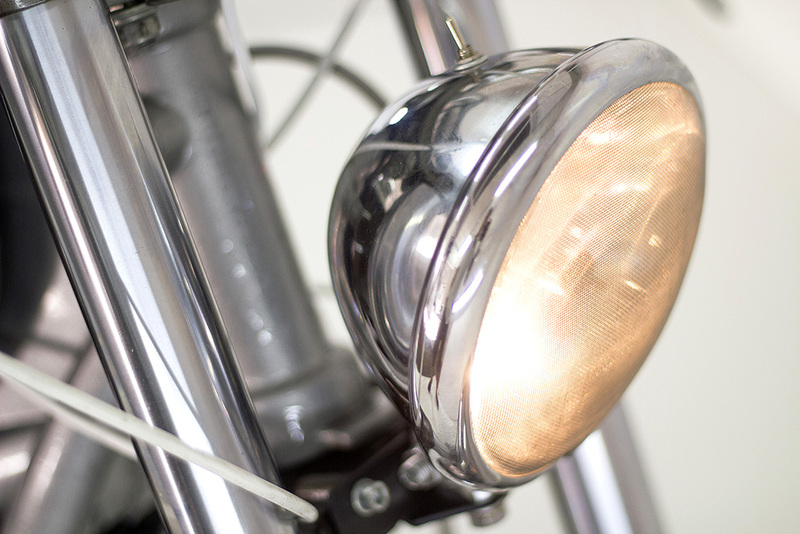 The air/battery box has been removed, as have any redundant brackets, leaving behind the desired exposed frame – now finished in silver, visually lightening this hot rodded Triumph Twin. Many agree that the early carb model Hinckley Triumph Twin is the pick of the bunch, technically simple and tuneable with the most basic of tools. 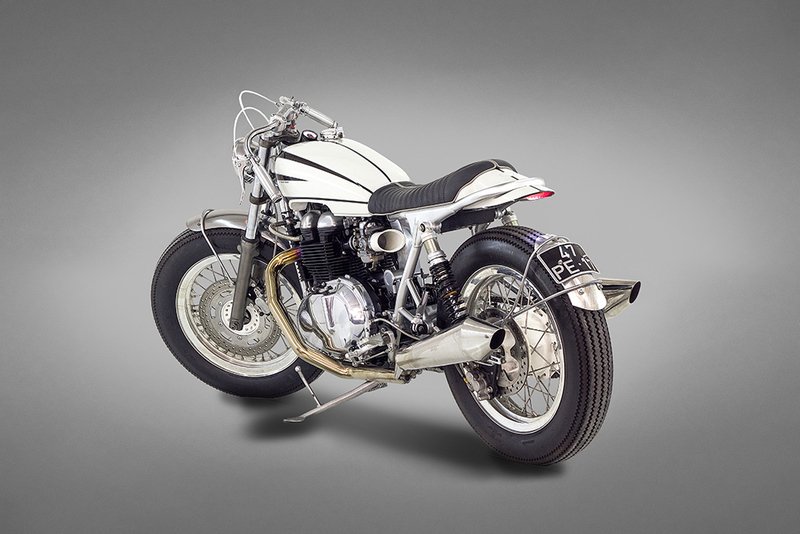 That simplicity allowed for the swopping of the tank for a much lower and more streamline custom item, which not just hugs the cam cover of the 865cc engine, but envelops it – a tank finished in a classic paint scheme, described as creating a sensation of movement. 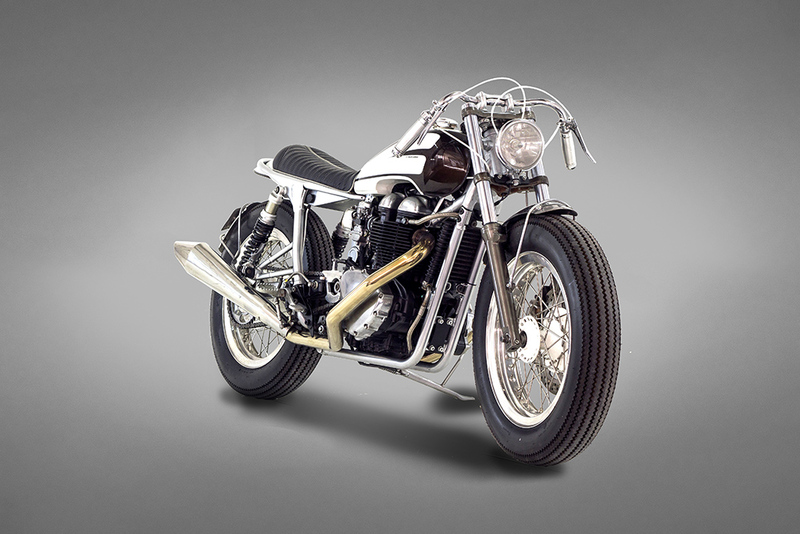 The custom seat cowl is upholstered in black leather and grey trim, and continues the lines to the rear of the Triumph, enveloping the new frame loop before culminating in a small stop and tail light. Under which is the new custom made battery box containing a lithium battery, and the Twins minimal electrical system, which now includes a RFID keyless ignition system. Usually the unsightly rectifier can be found strapped to the Triumph Twins bottom yoke, on display like some sort of homage to half arsed design. 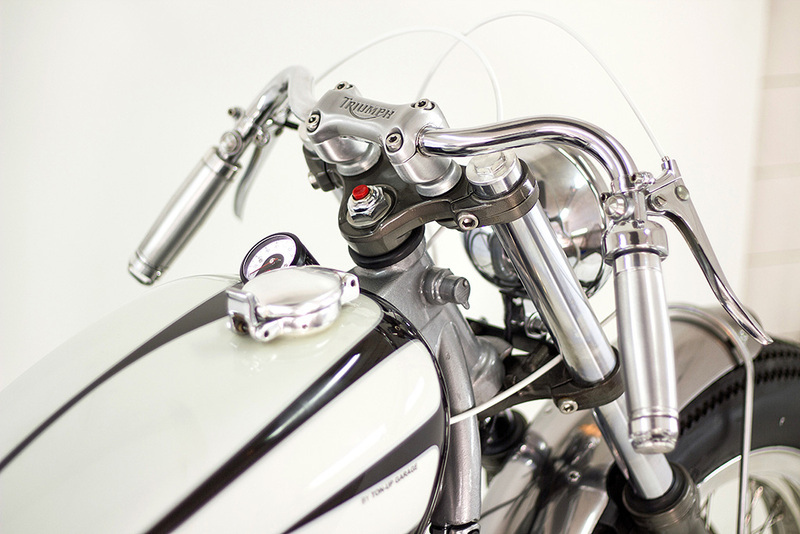 Many relocate the rectifier to the frame rail where it can stay cool, but isn’t as unsightly – but here on the Hot Rod the unit has been upgraded and moved to under the seat cowl, protected from what the 18” rear wheel, wrapped in Firestone Deluxe Champions throws up by a custom made mudguard/numberplate holder suspended millimetres off the rear tire. 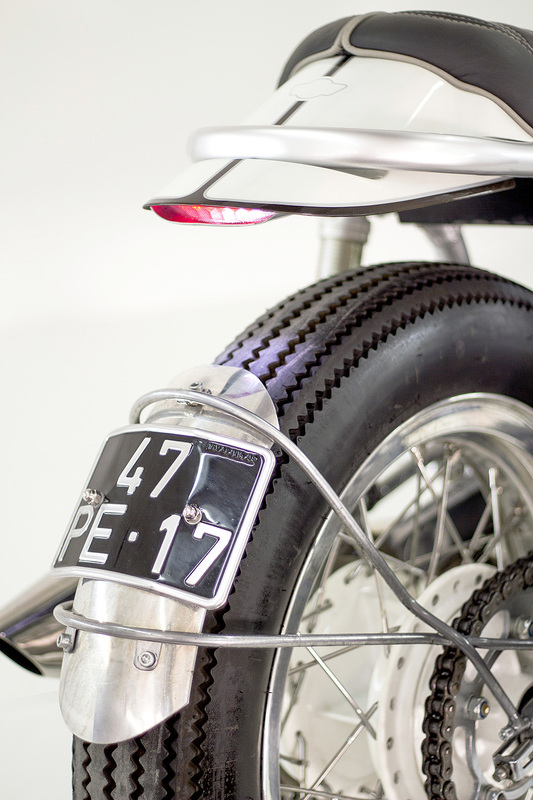 At the front is a matching 18” wheel, again wrapped in retro Firestone rubber, with the dust being kept off the classic bottom mounted 5¾” headlight, and out of the riders face by a custom bobbed mudguard. Up top is a Motogadget Tiny speedo, telling the rider all he need know at speed, which leads us on to the handlebars, a specific choice as Daniel and Pedro dint want “to use the most common models…”These were fitted with custom CnC’d grips, capped with Motogadget M-Blaze indicators. Switches on this build have been kept to a minimum, with the stock items being replaced by micro switches, with a big red start button being fed through the steering stem, finishing the controls are a set of retro cable brake and clutch levers, with the brake lever operating the hydraulic system hidden under the tank. 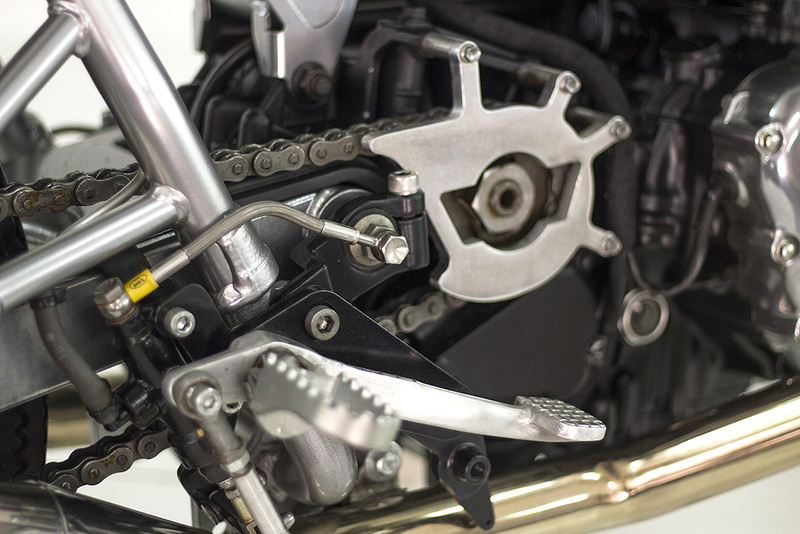 The rear brake also operates differently, rather than being fed under and along the swing-arm, its being fed through the swing-arms hollow spindle bolts, located just forward of the new rear sets and serrated foot-pegs, and out the other side and down to the rear brake calliper. “We’ve tried to have a lot of technical details different from previous models, we’ve built and have the bike as clean as possible. These are new challenges we give to ourselves to go further on the builds we do”. 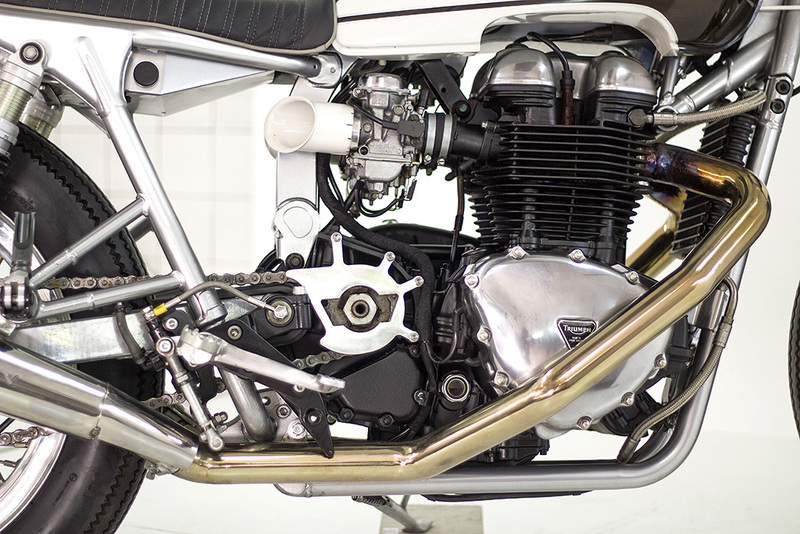 The Air-Cooled 865cc carb fed engine hasn’t missed out, being fitted with a classical styled stainless steel exhausts system and velocity stacks painted white to match the tank and seat cowl. The stock sprocket cover has thankfully been replaced by a custom item featuring a cut-out Ton Up logo. A much needed suspension upgrade finishes the Hot rod off, being fitted with a set of Öhlins shocks and springs. 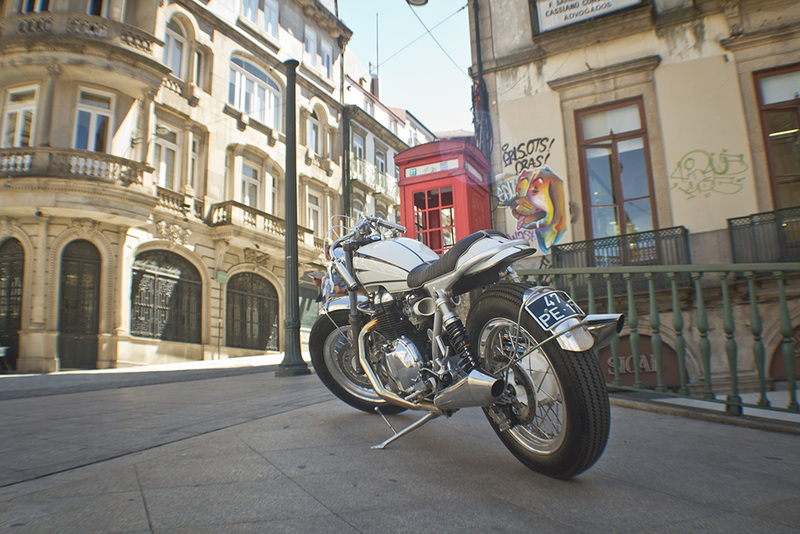 A fantastic and attractive build by Daniel and Pedro, demonstrating that custom builders on the continent are leading the way when it comes to modifying the Hinckley Triumph Twin!